Lithium-Ion Batteries Become Harder to Recycle | HOBI International, Inc.
Lithium-ion batteries are becoming increasingly commonplace and as manufacturers aim to make lithium-ion batteries as cheap as they can, they’re removing valuable elements that make them worthwhile to recycle, according to the Electric Power Research Institute (EPRI). The EPRI assessed and reported on end-of-life cost of batteries that was reported at the end of last year. 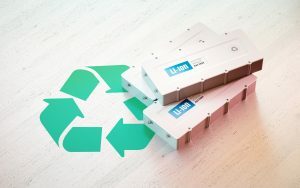 Ben Kaun, the program manager for EPRI’s Energy Storage Program, told members of the Illinois Commerce Commission that the lack of recycling adds an end-of-life cost to lithium-ion batteries. According to the Royal Chemistry Society, the cost of cobalt, which is heavily used as a cathode material in all batteries, jumped from $32,500 to $81,000 in just over a year. In response, battery manufacturers have opted to redesign batteries to minimize cobalt. In May, Tesla CEO Elon Musk said the company had all but eliminated cobalt from batteries it uses in automobile and stationary batteries. However, doing so will help keep batteries cheap — as in too cheap to recycle. Without valuable contents recyclers have little incentive to capture used batteries, Kaun said. Without a recycling market, battery owners are left with a disposal cost instead of a recycling incentive. But academics are working on the problem, including Yan Wang, a professor at Worcester Polytechnic Institute in Massachusetts and founder of Battery Resourcers, one of nine recycling firms listed on EPRI’s website. Wang also says that Battery Resourcers has developed a process for recovering cathode materials like cobalt, as well as aluminum, copper, plastics, graphite, methanol and other chemicals used in the recycling process. It’s striving to produce them cheaply enough that it will make sense for battery manufacturers to purchase recycled materials instead of mining new ones.